Josh “Skreech” Sandoval is a semi-pro skater from a small town in Orange County, CA who appears to have had potential for real success in the sport at one time. Josh lost his sponsors (and income) when his then girlfriend gave birth to his son Sid and he stopped competing to be a more responsible dad. The relationship with Sid's mother eventually fell apart, though, due mainly to the fact that Skreech spent most of his time skating and/or doing drinking and doing drugs. I don't doubt that he genuinely loves his son, but he loves his skate punk lifestyle more. 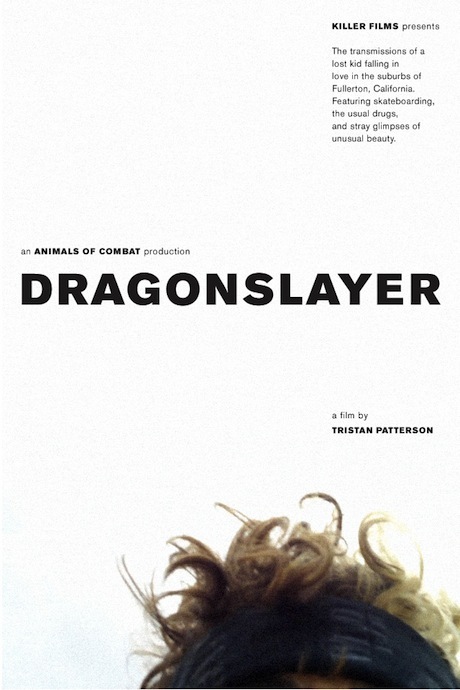 The documentary DRAGONSLAYER follows Sandoval as he travels more or less aimlessly, making a half-hearted attempt to get back into professional competitions along the way. We see him at a tournament in Denmark where he does well in the qualifying round, but then chokes in the finals. Most of the time we see Josh skating, though, it's in some abandoned suburban swimming pool purely for personal enjoyment. When he isn't skating, Josh mostly just hangs out with his friends listening to punk rock and getting high on whatever intoxicant is available. Director Tristan Patterson decided to follow Josh around for a few months documenting his life. He tries hard not to impose any directorial point of view on his film, letting Skreech's actions speak for themselves, not even offering any background on Sandoval's past. That's too bad, as it might have given us some insight into why we should care about him now. The closest we get to that is one scene where we see Josh is included in a coffee table book on skaters. He's labeled the “odd” one, which is something of an accomplishment considering pro skaters aren't the most conservative bunch to begin with. But that's about all we get, and the film never goes in depth or gets beneath the surface of its subject. 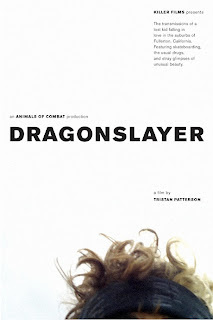 DRAGONSLAYER is well made, nicely shot and competently edited, but at only an hour and 14 minutes it still feels overly padded with scenes of Sandoval skating. Patterson never shapes his footage into a compelling story or convinces me that Sandoval was worthy of making a feature film about. The problem isn't so much that Josh “Skreech” Sandoval is unlikeable; it's that as presented here, he's not all that interesting. 2 1/2 out of 4 stars.